Jon Elliott, the Project Manager, gave us a very warm welcome before taking us on a guided tour of the site, starting with the only remaining section of the original bridge, that was built in 1922. The old bridge had reached the end of its operational life and was beyond repair. Not replacing the bridge would have meant closures of traffic lanes, footways and cycle tracks, as well as restrictions on the type or weight of vehicles that use the bridge. Also closing lanes to carry out maintenance would have caused considerable disruption to traffic and rail operations in the long term. The new structure replacing the existing bridge has a design life of 120 years and will have improved footways, lighting and better facilities for cyclists, making this section of the A406 safer for all users. The last section of the old bridge was still standing because it contained 275Kv water cooled primary electric cables that could not be diverted. The cables have recently been decommissioned so this is no longer the case but whether it is demolished now, or at a later stage, depends on the availability of additional funding. 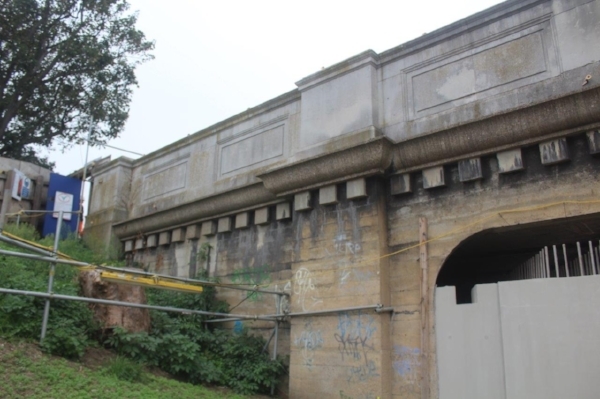 The immediate cost of demolition would be around £3 million but needs to be considered against the significant cost of maintaining the old bridge and re-establishing the works in future. It’s retention meant that we had the opportunity to see the decorative design that went into bridge design back in the early 20th century. It is evident that this has been a project with many varied challenges in both sensitive road and rail conditions. Keeping the main road A406 open necessitated 26m deep piling and the bridge foundations being installed below road level in restricted access and low headroom conditions beneath the existing Power Road bridge and adjacent to the live railway lines. The concrete needed to supply the construction works had to be pumped 160m from the site compound via steel supply lines which had to cross over the Power Road Bridge. 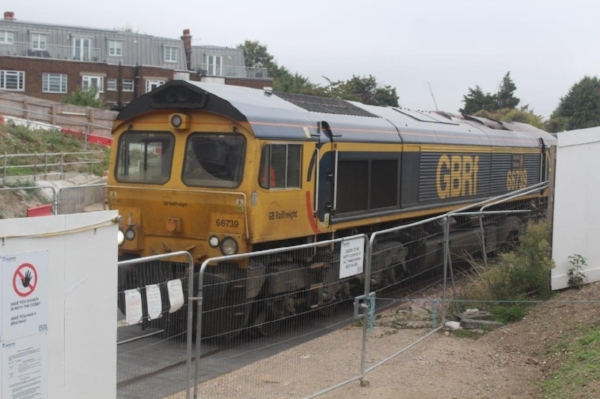 The construction over the rail track has involved compensating Network Rail for train diversions and keeping costs and disruption at a minimum has involved long hours and working many weekends. The demolition was carried out in two phases during a 75 hour and a 100 hour disruptive railway possession. The size of the project and the quantities involved are considerable. It took two 500 tonne cranes to lift the service bridge into position which weighs around 104 tons. The main bridge consists of 3500 tons of concrete and reinforcing bar. The new bridge deck consists of 28 precast prestressed beams, which were fabricated in Ireland and installed during 4 separate 48 hour railway possessions. The project team, which is multi-national and comprises both men and women, attributes much of its success to inclusiveness, support and collaboration. Jon believes that the influence of women working on site has been very positive, resulting in an outstanding safety record of zero accidents since the project started over 4 years ago. The project has also won two Silver CCS awards and was also the first surface transport site to gain the TfL Beacon award for high performance in safety. Jon feels that it is very important to make the site welcoming to women and for them to feel comfortable and included in the workplace. There are the obvious practical facilities provided for women, such as the spacious toilet block (not a given on many sites). But, perhaps more importantly, if there are the occasional inappropriate behaviours or comments towards women, Jon and his team have no hesitation in calling these out. Zero tolerance has played a major part in fostering mutual respect. There's a great sense of community on the site, not least with the mini market garden they have created. Topsoil from the construction site has been used to grow an abundant crop of flowers and vegetables making the kitchen self-sufficient. They've won a few awards for this too – in the London Underground in Bloom competition. 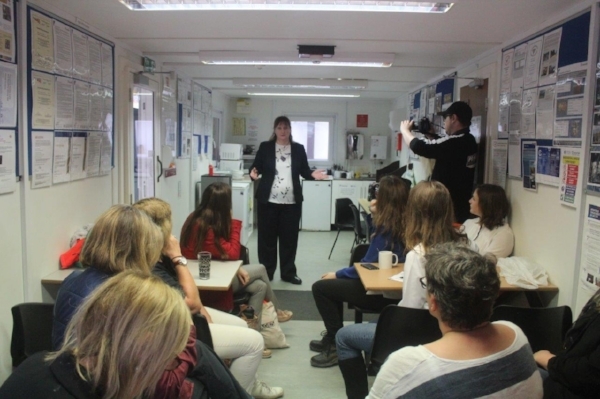 Providing female role models is something we love to do at Women in Transport so it was great to hear a talk by Sharon Duffy, Head of Transport Infrastructure Engineering at TfL, who is responsible for some 500 engineers. Sharon stressed how much diversity and inclusion matters and how important it is that we should be using inclusive teams to create inclusive cities. 'It's vital that you include people who are representative of the community being served and it makes good business sense too'. She went on to give examples of how inclusiveness can result in decisions being taken in the early stages of planning, avoiding additional costs later in the project. Sharon endorsed Jon's comments saying that surveys indicated that as many as 50 per cent of females are unhappy about inappropriate comments from male colleagues. She said we will only remove that culture by talking – not tolerating. We were also interested to hear a talk by Karen McWalter, the Environmental Advisor at HOCHTIEF. Karen explained that the Power Road project scores high on sustainability, with all general fill materials being blended from a local recycled materials centre and also 95 per cent of all materials leaving the site are recycled. Karen also inspired us with the story of her career journey from being a police officer, and working in a housing charity, rising through the construction industry to her current role. By following her passion, returning to college on day release and eventually joining the Kier graduate scheme Karen learnt all aspects of the construction business before switching to sustainability. She says there are opportunities to diversify in the industry. However, she also said that in her 20 years in the business this was not only the first time she had been part of a women's group on site but that she was often the only woman on the site. And the Power Road bridge project is indeed an exemplar of a collaborative and inclusive culture that results in outstanding work performance. Our grateful thanks to HOCHTIEF UK and Transport for London for hosting this most enjoyable and interesting site visit.